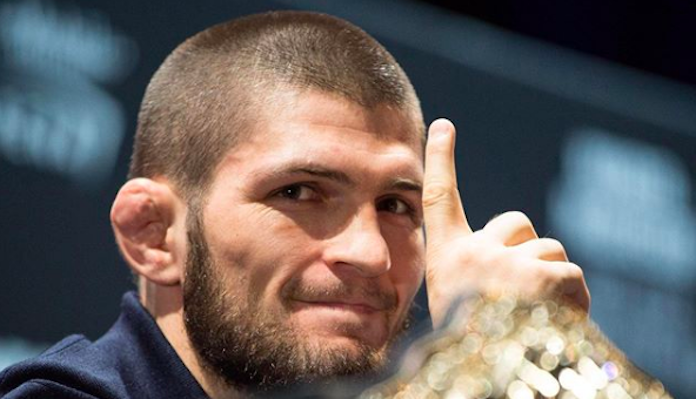 UFC lightweight champion Khabib Nurmagomedov has issued a challenge to undefeated boxing legend Floyd Mayweather. Khabib Nurmagomedov is coming off arguably the biggest of his career at last weekend’s UFC 229 event, submitting former division title holder Conor McGregor in round four. As seen in the above video, “The Eagle” teased “Money” after he was able to drop “Mystic Mac” in the second-round of their UFC 229 headliner, something Mayweather was not able to accomplish during his ten-round boxing match with McGregor. Floyd Mayweather has not competed inside the squared circle since defeating the aforementioned Conor McGregor via tenth-round TKO in August of 2017. The undefeated boxing legend is expected to rematch Manny Pacquiao this December. Khabib Nurmagomedov is still awaiting his official punishment from the Nevada State Athletic Commission, this due to his post-fight actions at UFC 229. An official hearing to determine the fates of both Khabib Nurmagomedov and Conor McGregor will take place on October 24. Would you be interested in seeing a fight between current UFC lightweight champion Khabib Nurmagomedov and undefeated boxing legend Floyd Mayweather?